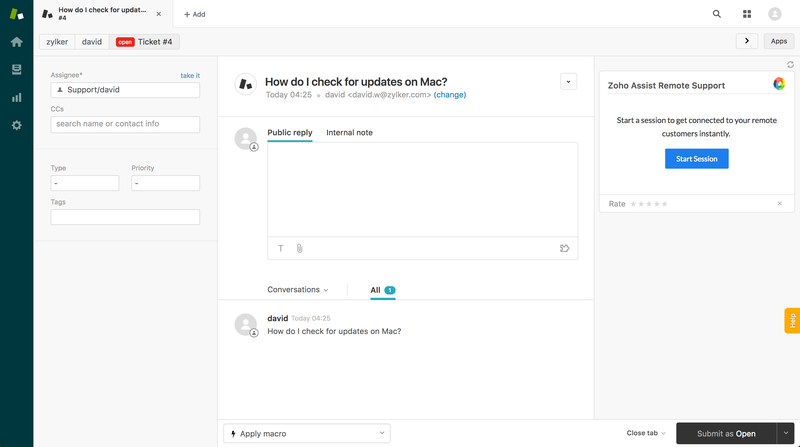 Integrated Remote Support for Zendesk. Intensify the value of Zendesk by providing remote assistance right from your support tickets. Zoho Assist with Zendesk. Remote assistance at a go. 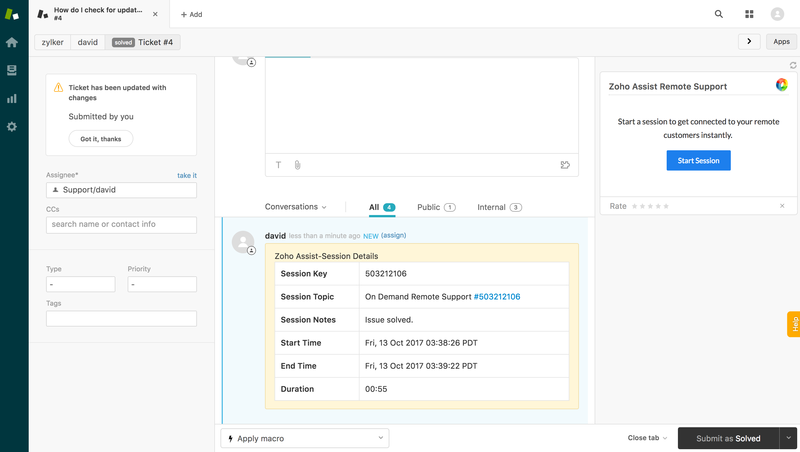 Offer instant remote support right from your Zendesk tickets by bringing your Helpdesk and Remote Support solution together. Not only generate a remote support session but also capture session details in your support tickets. Enabling your support team to view the remote customer's computer screen in real-time leads to faster resolution of issues. It means more satisfied customers and increased first-contact resolution rates. Reduce ticket handling time by allowing your customers to share their screens with your support team. Session details such as session duration, session notes, post-session survey results and even Zendesk ticket status are logged back into ticket records for your future reference. With Zoho Assist and Zendesk, you can easily access remote computers, servers and iOS/Android mobile devices and support your customers from the cloud. Zoho Assist works well with all major proxies and firewalls. It offers advanced troubleshooting features that help you improve the overall satisfaction rate. Unlike traditional remote desktop or remote access software, Zoho Assist is completely web-based and requires no prior installation either at your support team's end or your customer.